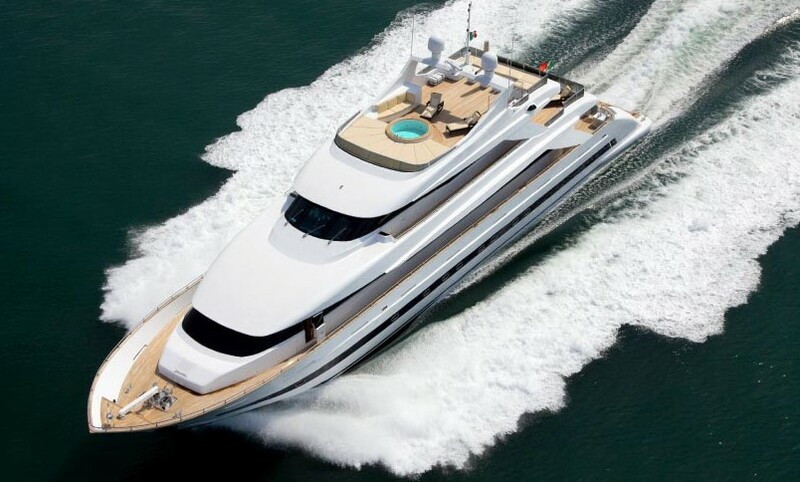 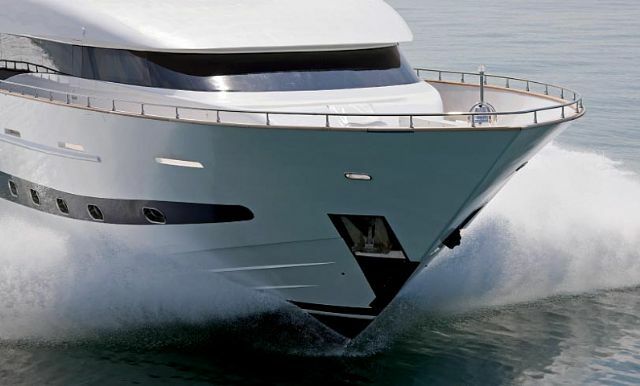 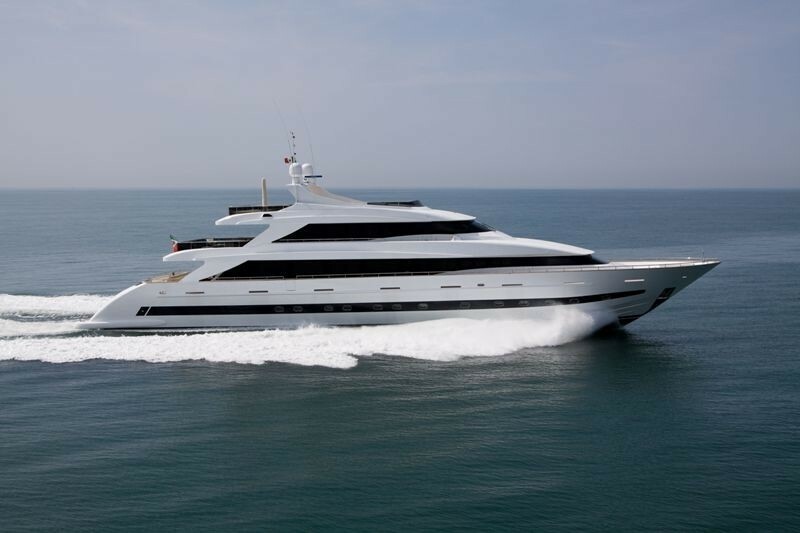 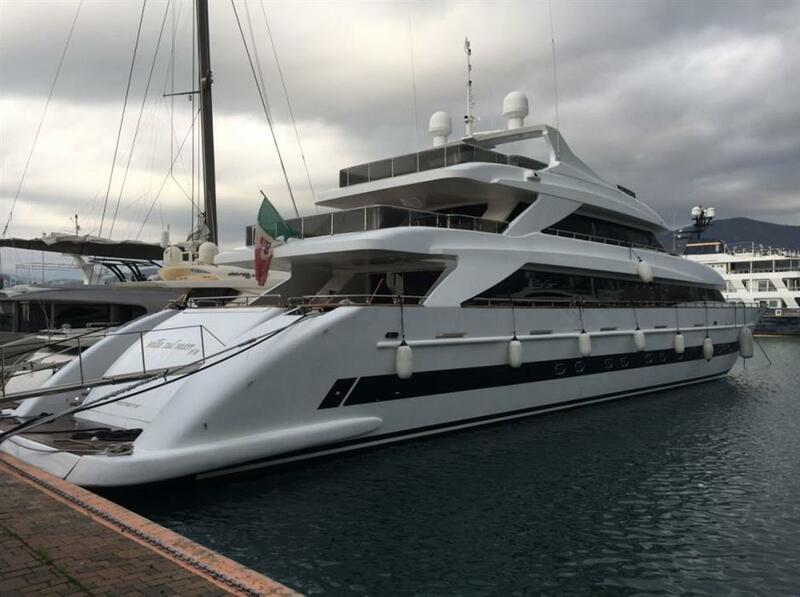 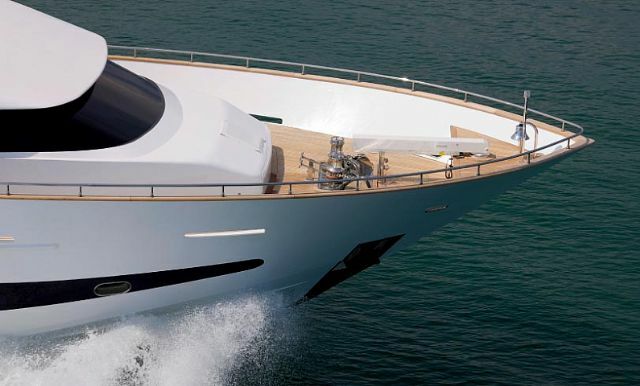 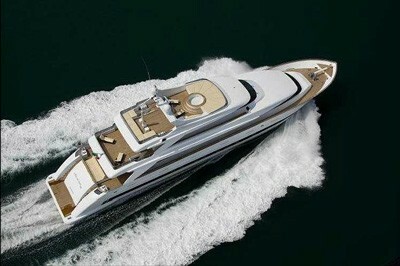 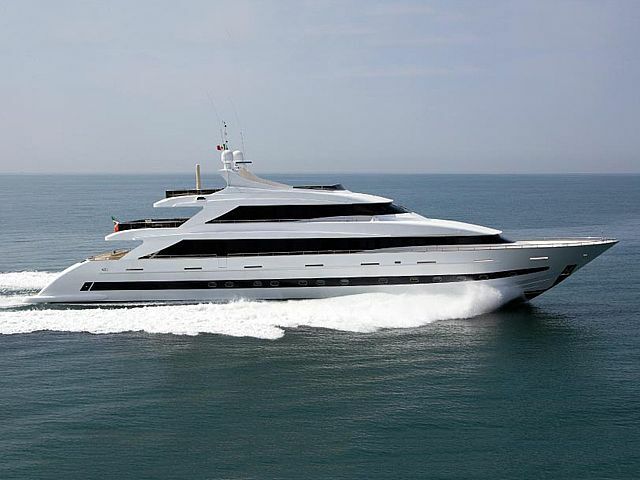 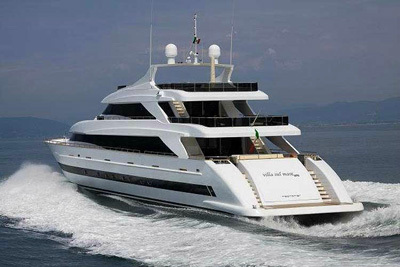 Superyacht VILLA SUL MARE is a luxury motor yacht that was launched in 2009 by Tecnomar shipyard, measuring 44m (144,4ft). 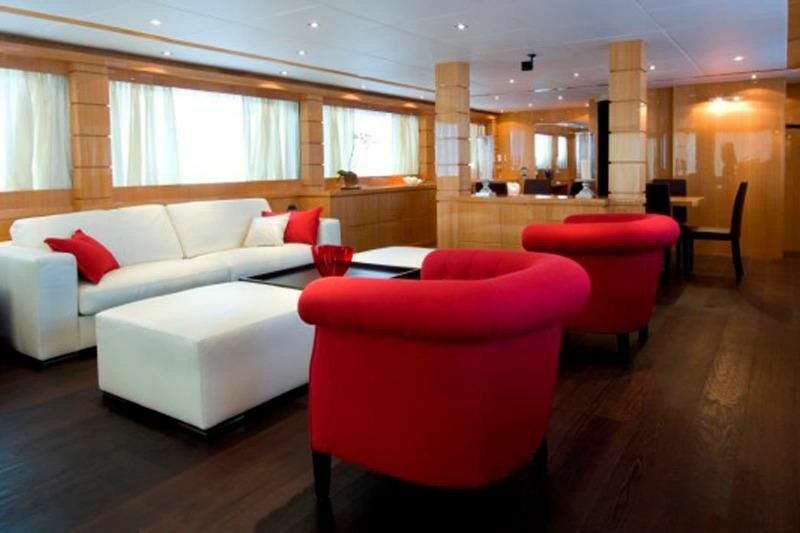 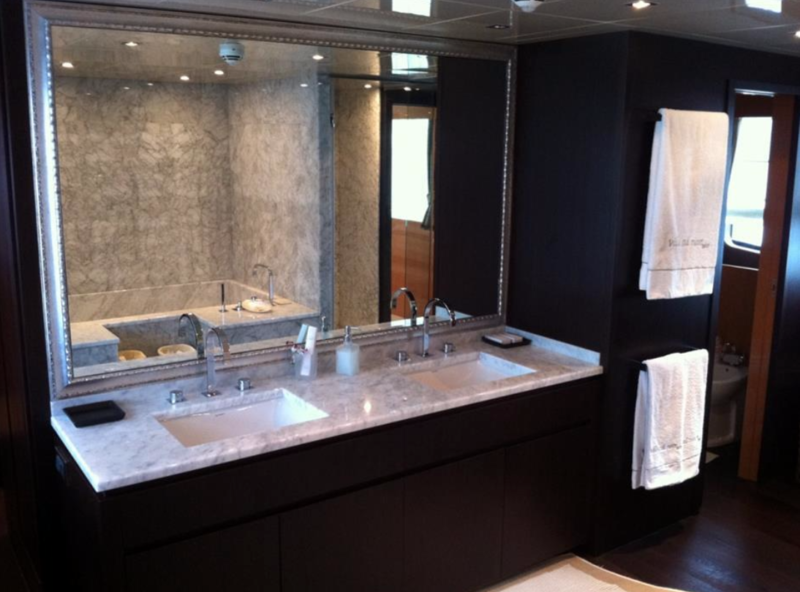 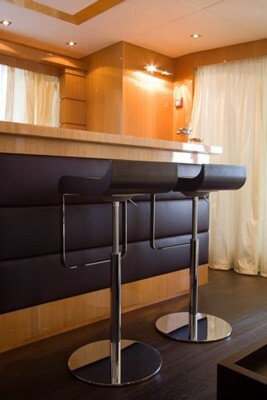 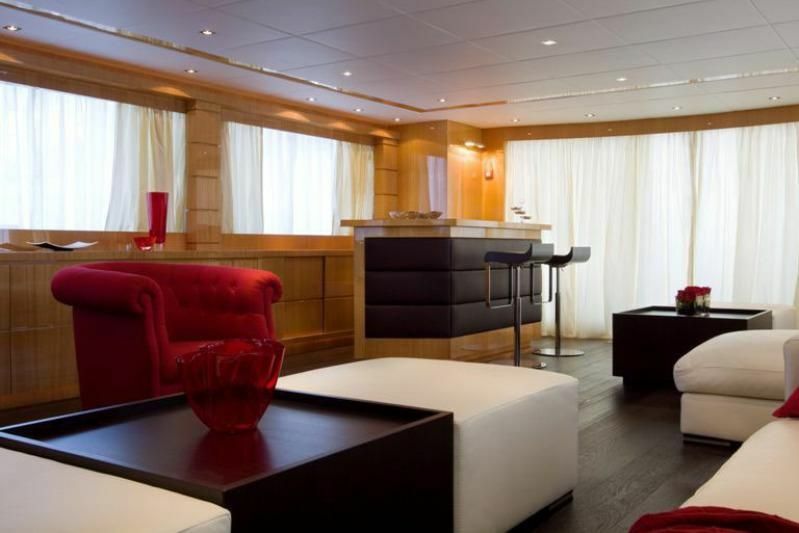 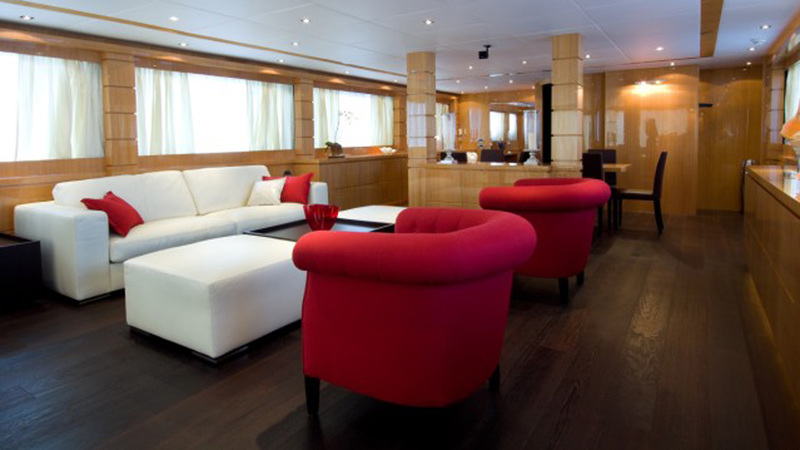 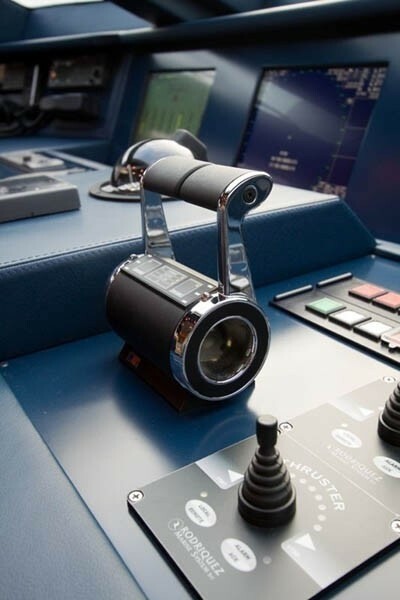 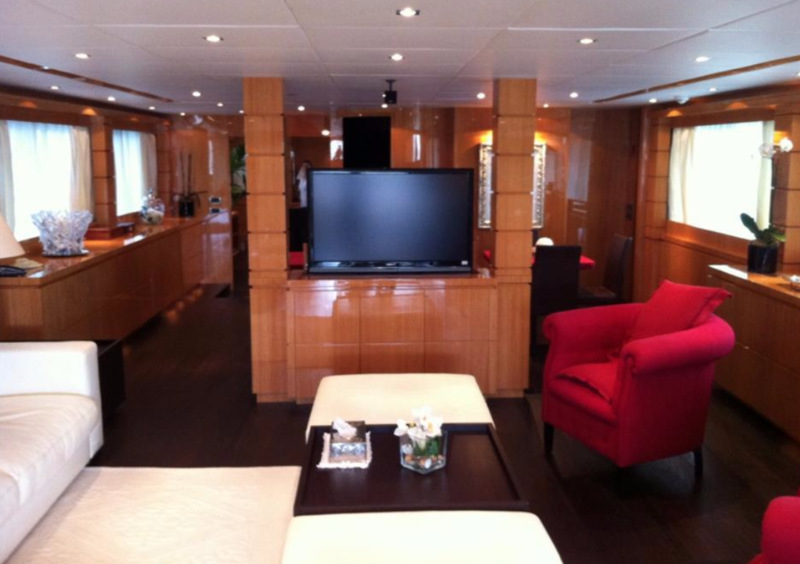 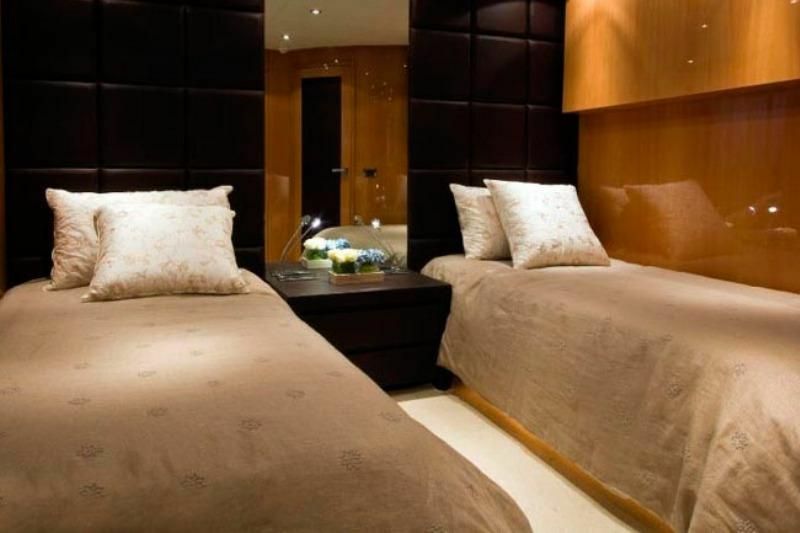 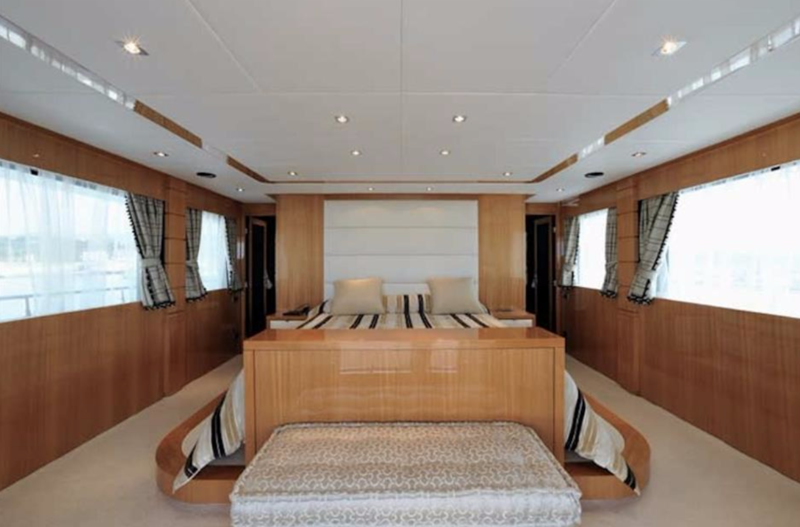 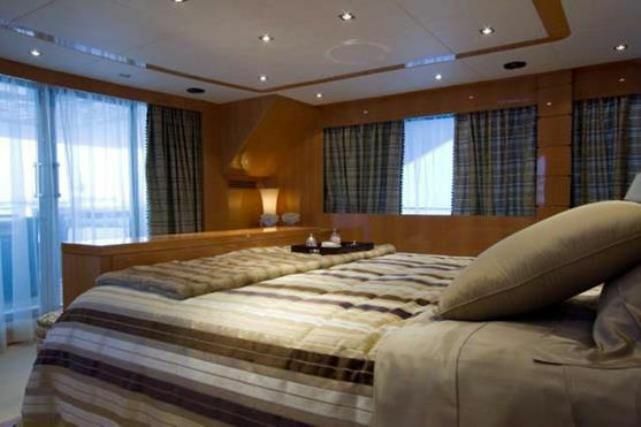 She offers deluxe accommodation for 12 charter guests in 7 cabins. 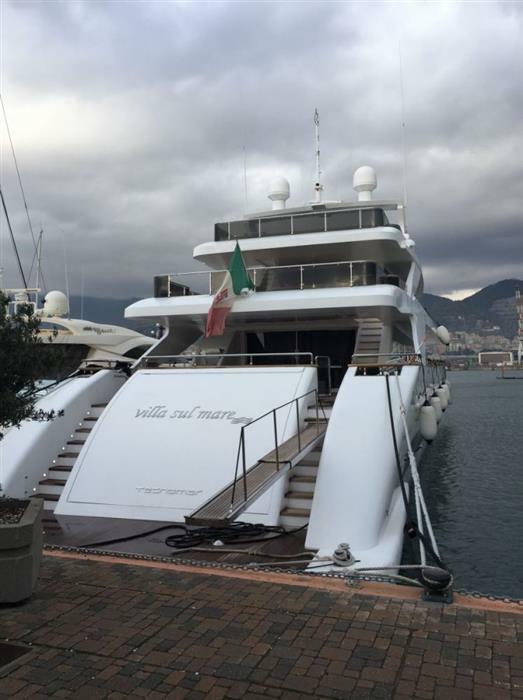 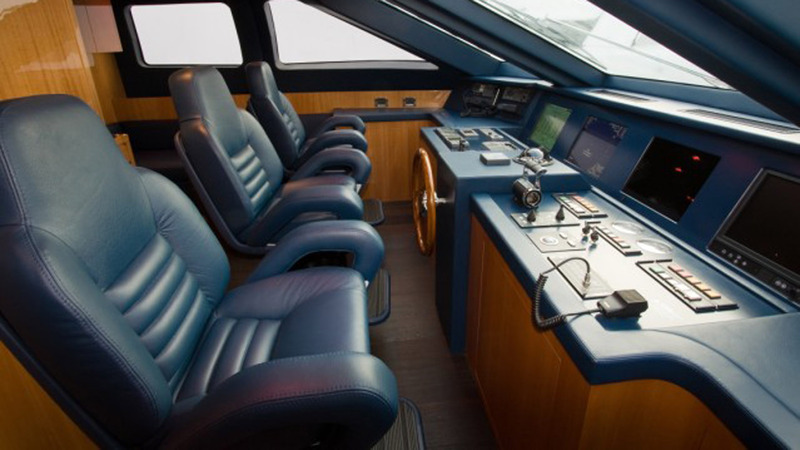 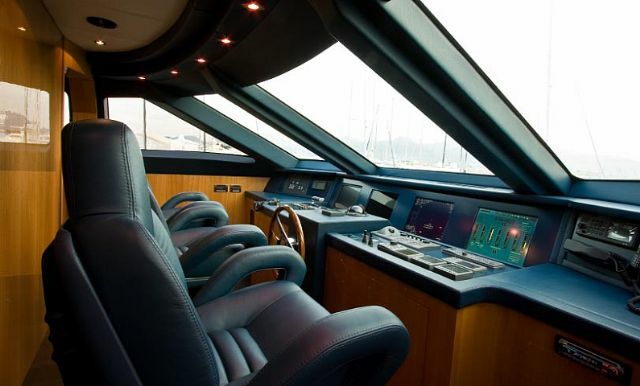 VILLA SUL MARE motor yacht is a stunning tri deck design that is available for charter in the West and East Mediterranean. 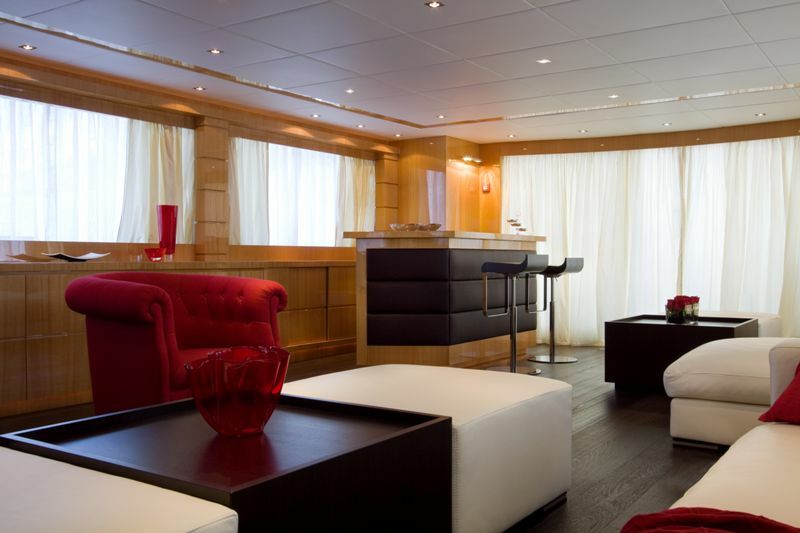 Motor yacht VILLA SUL MARE boasts a contemporary chic and spacious interior by Claudio Colucci, who is renowned for his simple yet sensual designs. 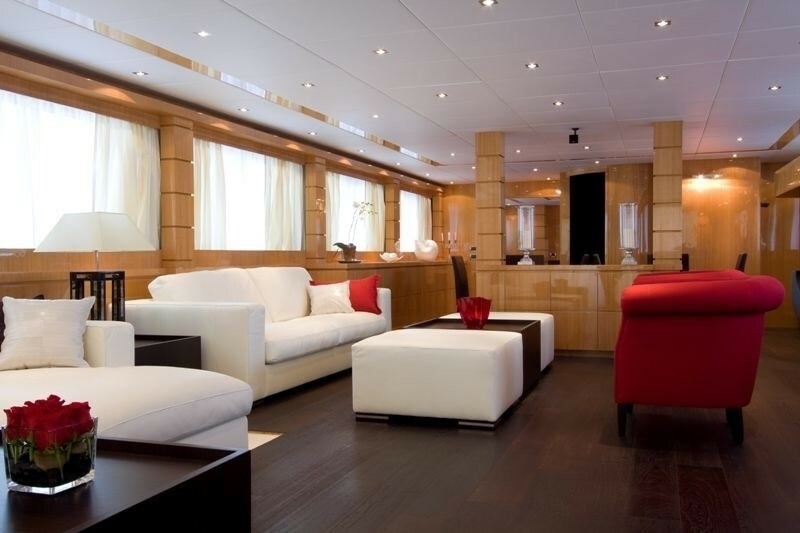 The salon is ideal for entertaining, featuring ample sofas in crisp white and inviting reds, occasional chairs, coffee tables, ottomans and a complete wet bar, all set on a luscious espresso-toned dark wood floor. 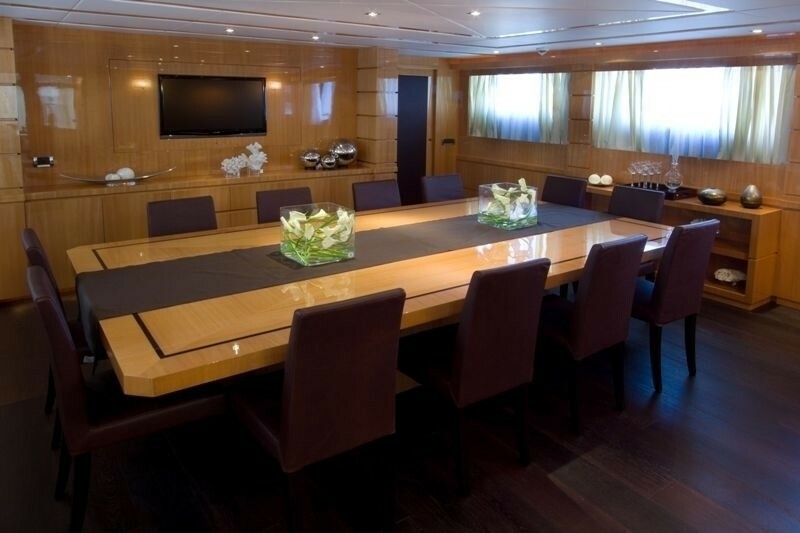 Further forward the formal dining table is elegantly separated from the salon, creating an intimate atmosphere. 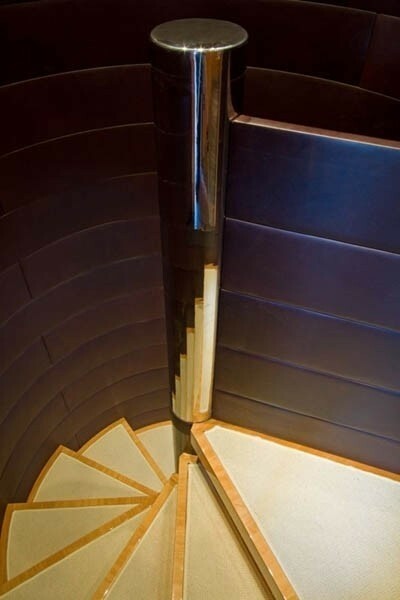 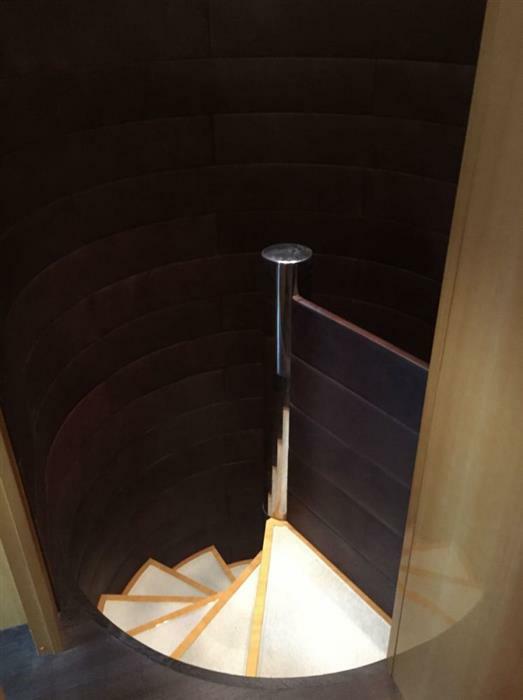 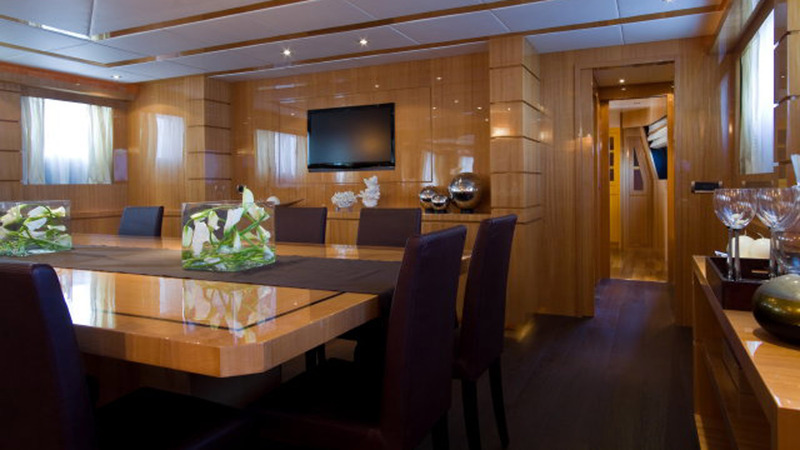 The intriguing leather walled main foyer, leading to 6 of the guest cabins, is forward of the salon and dining amidships. 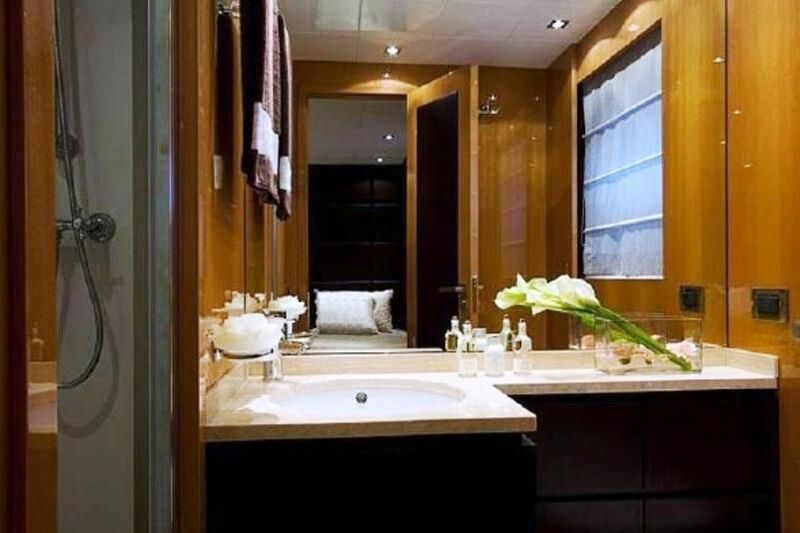 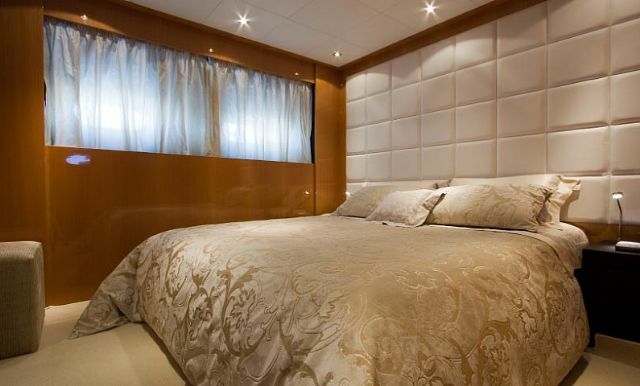 Charter yacht VILLA SUL MARE offers an impressive owners stateroom on the upper deck boasting a centre lined king size bed, study space, full en-suite with marble tub and separate shower and private deck space offering ample seating and romantic dining. 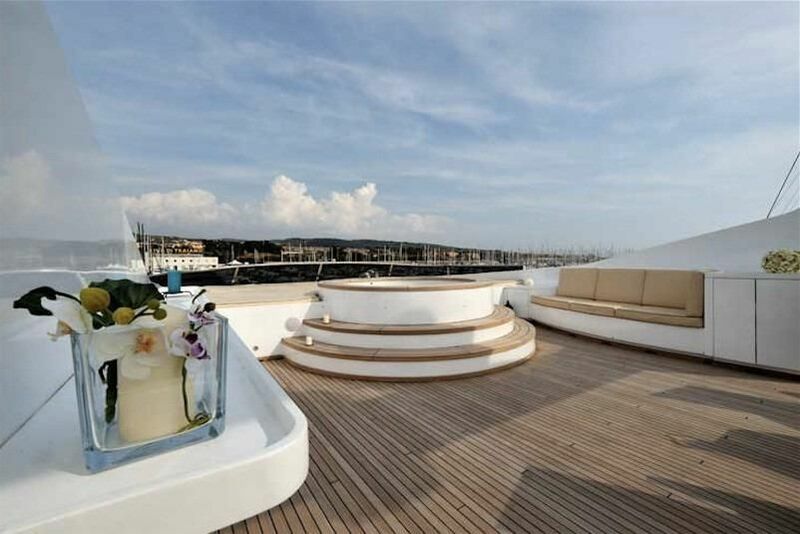 VILLA SUL MARE has plenty of exterior areas to enjoy the Mediterranean climates. 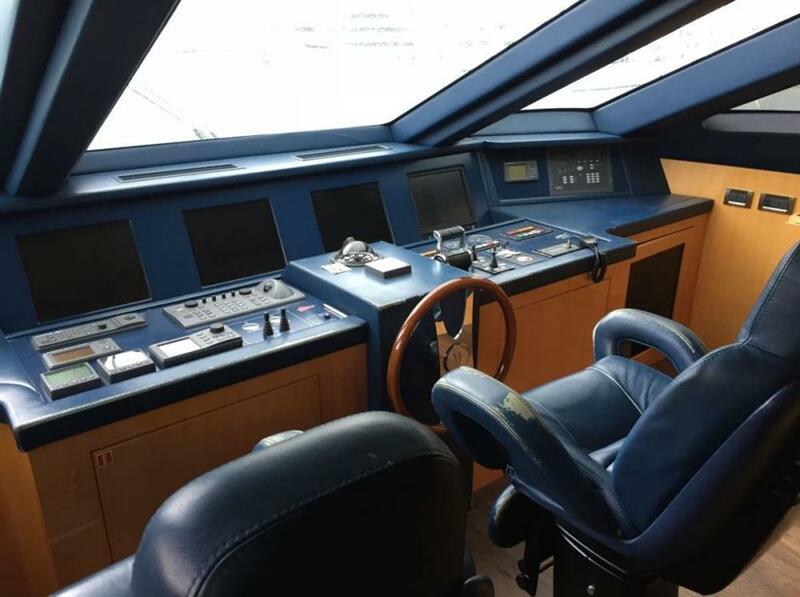 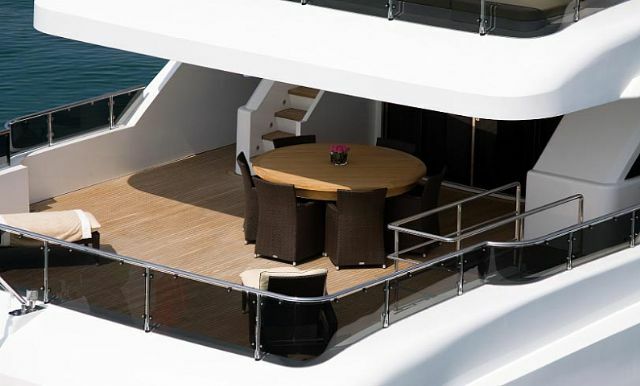 The main aft deck is adjacent to the salon and offers an alfresco dining option and generous seating, perfect for extending the salon entertainment outdoors. 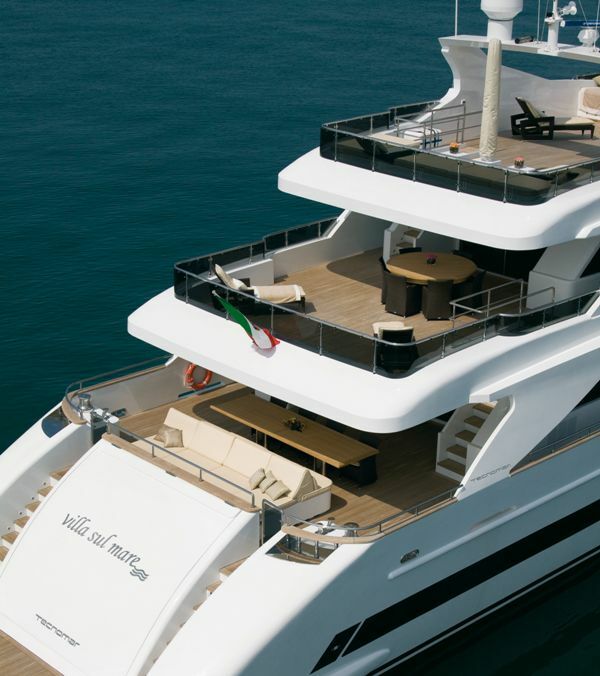 A full beam swim platform is ideal for effortless water access to enjoy the water toys that motor yacht VILLA SUL MARE has available. 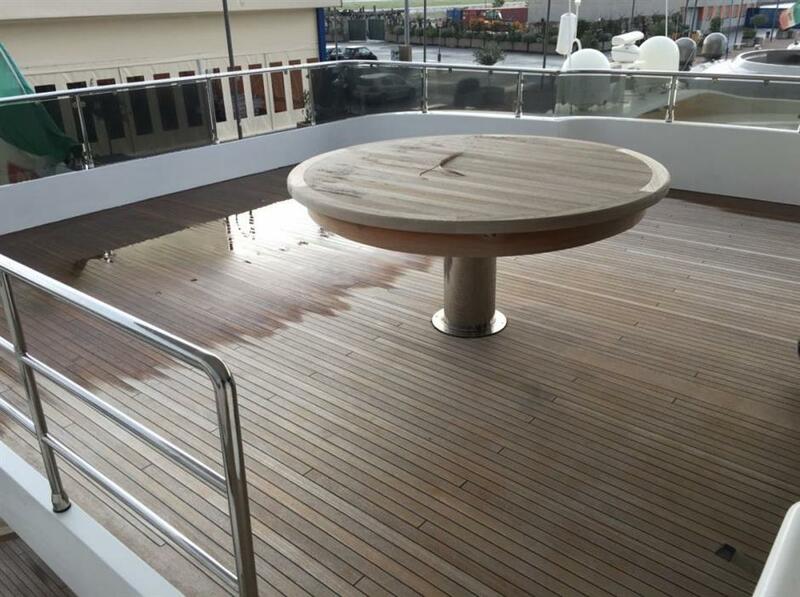 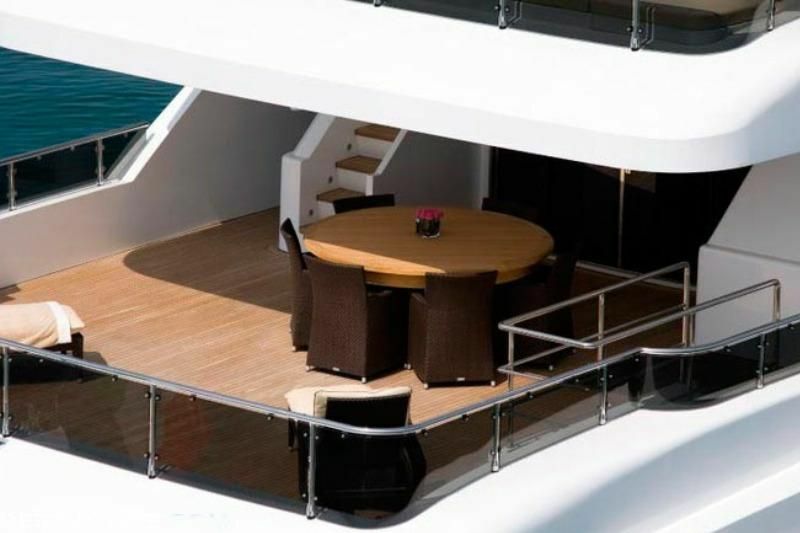 Above the main deck, the upper deck features the owner's suite with private deck space. 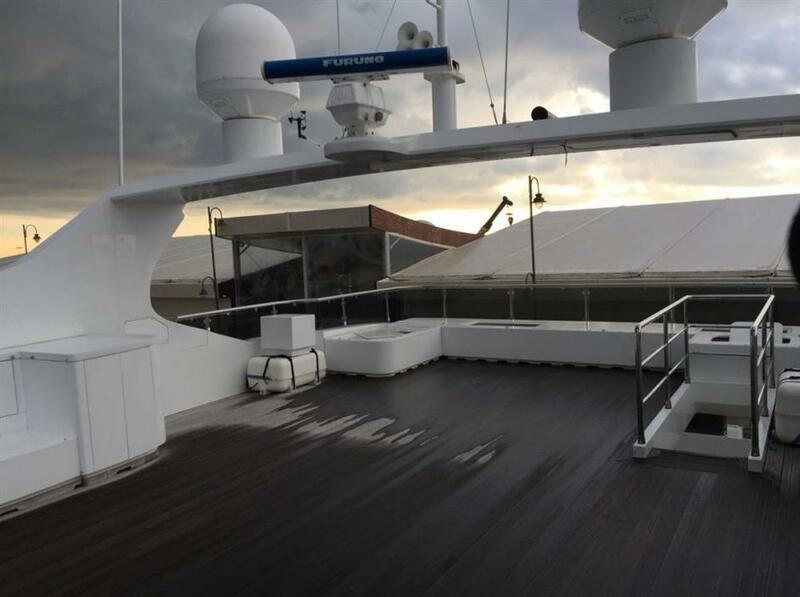 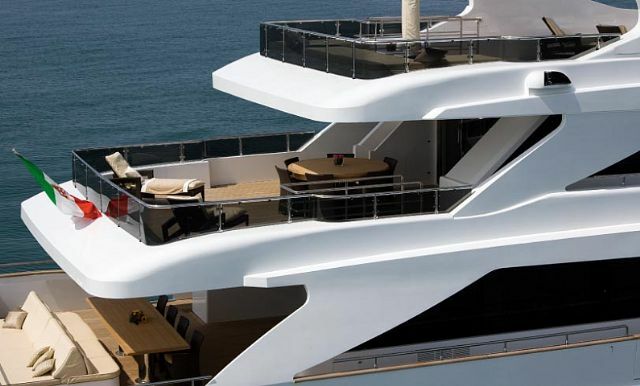 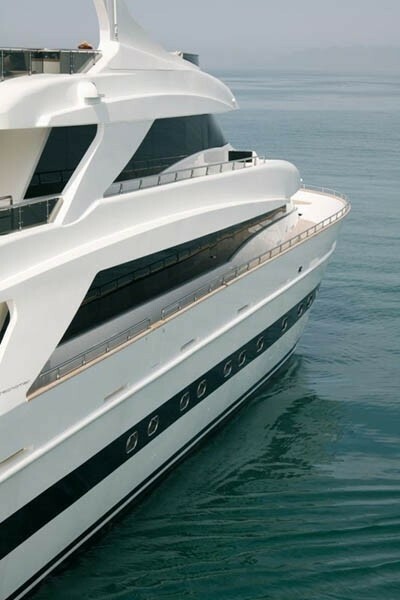 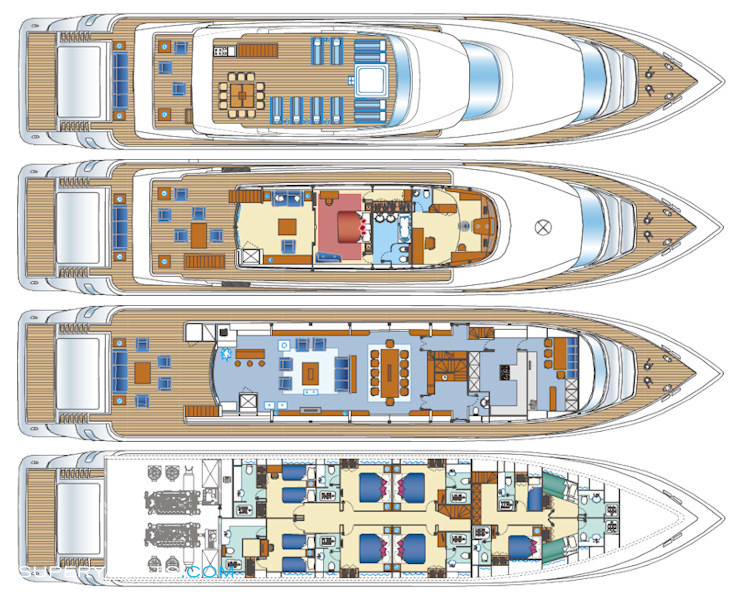 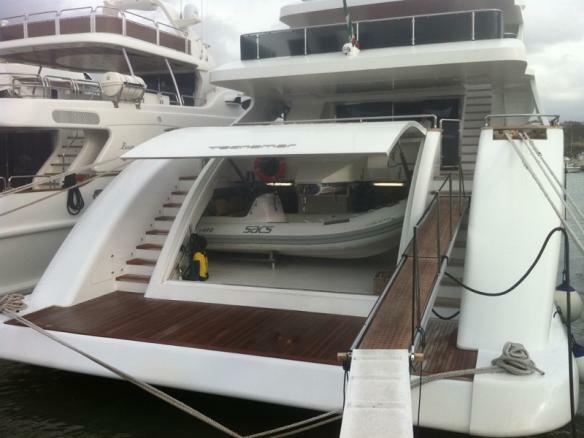 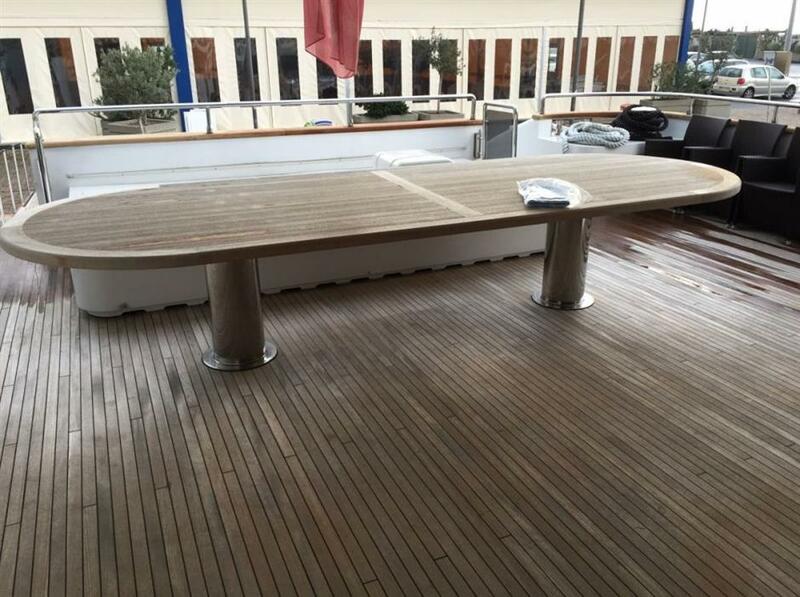 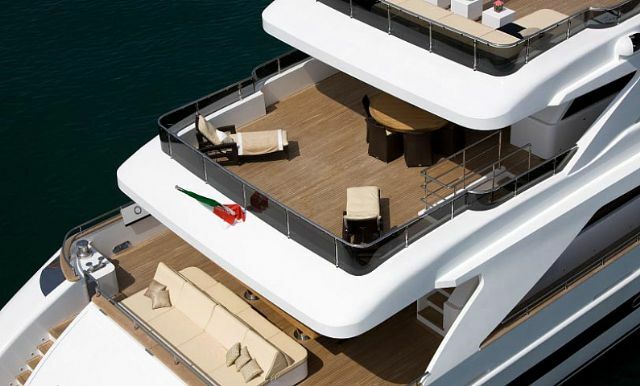 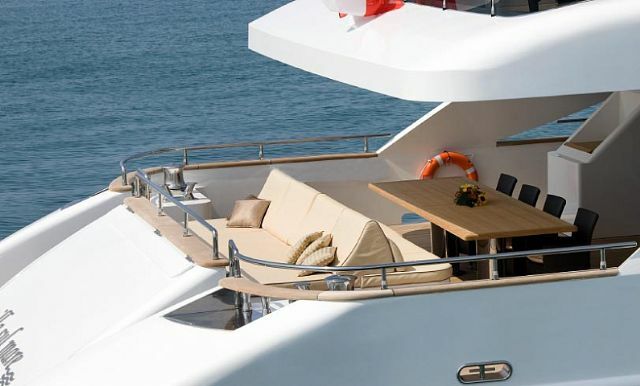 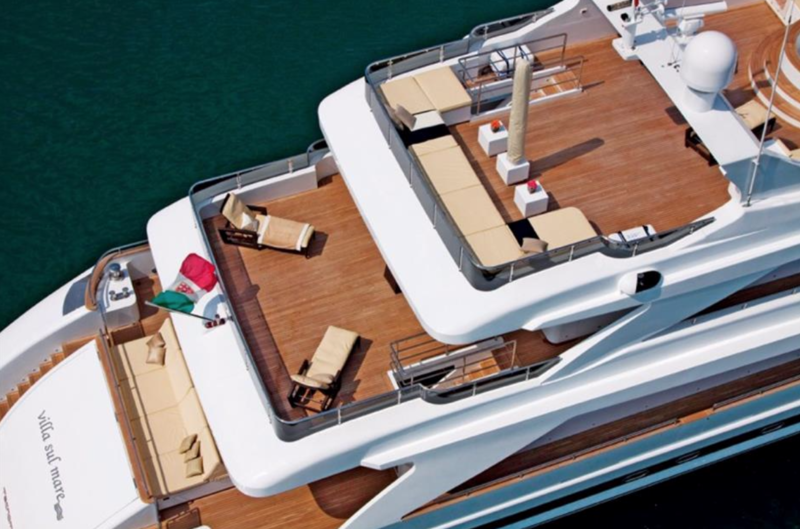 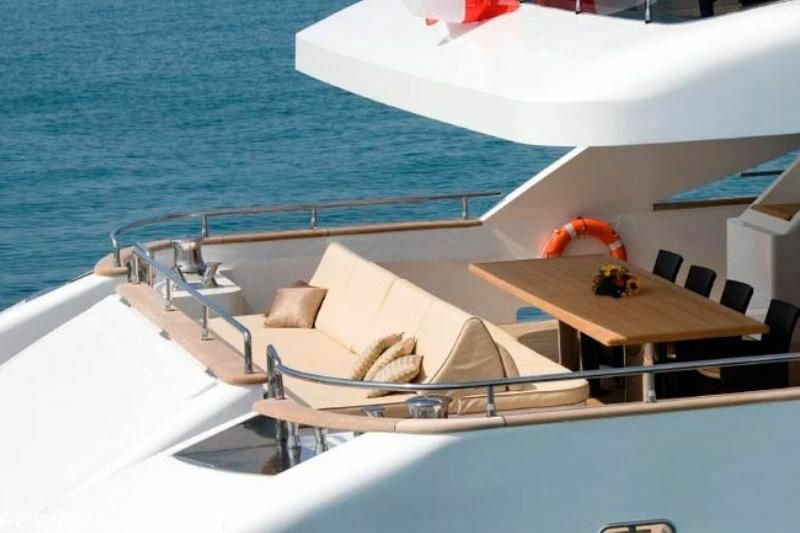 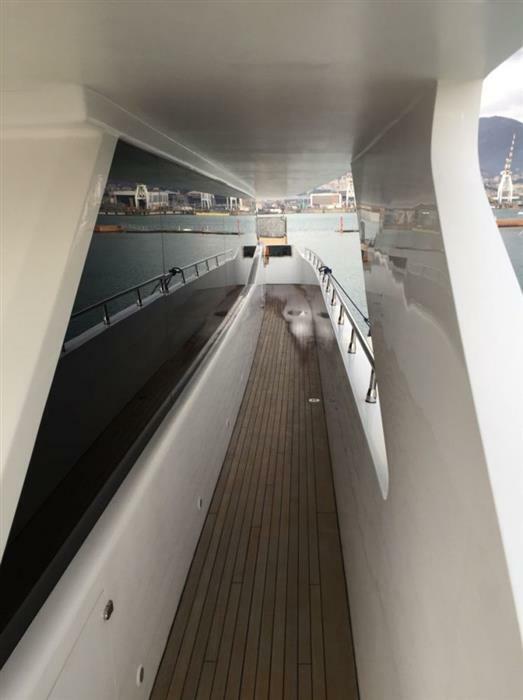 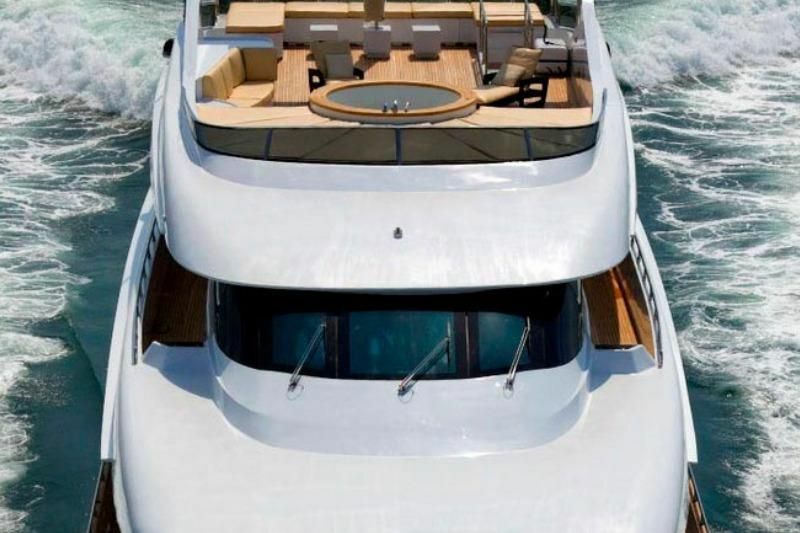 There is a large sundeck complete with cocktail seating, an alfresco dining table, chaise lounges and a massive sunpad. 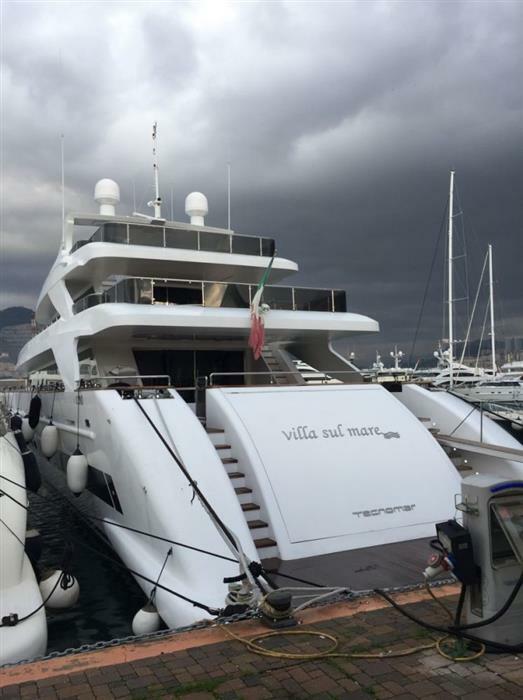 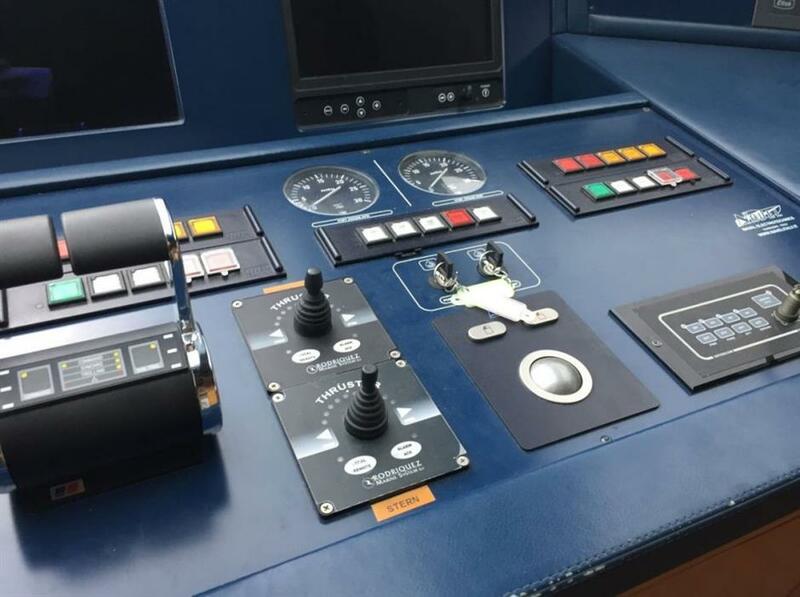 Luxury yacht VILLA SUL MARE is powered by 2 MTU 3850hp engines, she cruises easily at 14 knots and can reach top speeds of 25 knots. 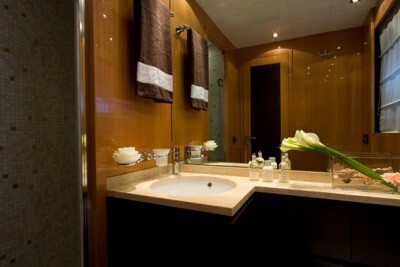 Yacht VILLA SUL MARE offers deluxe accommodation in 7 cabins. 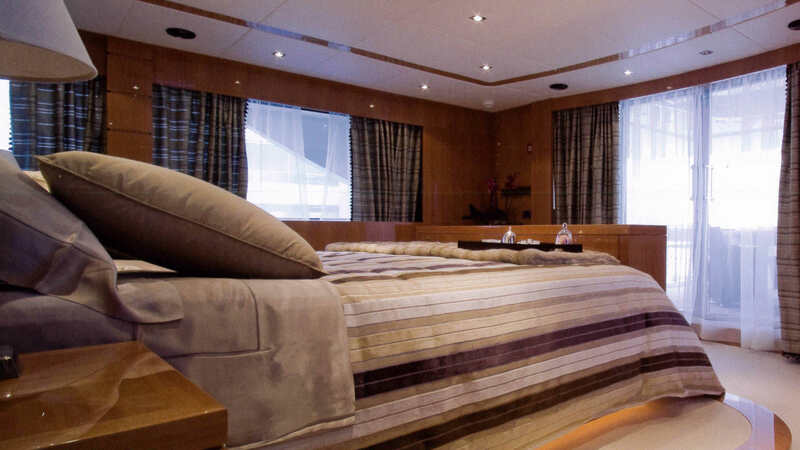 The owners suite is on the upper deck and features a king size bed, study, marble en-suite and plenty of natural light from surrounding windows. 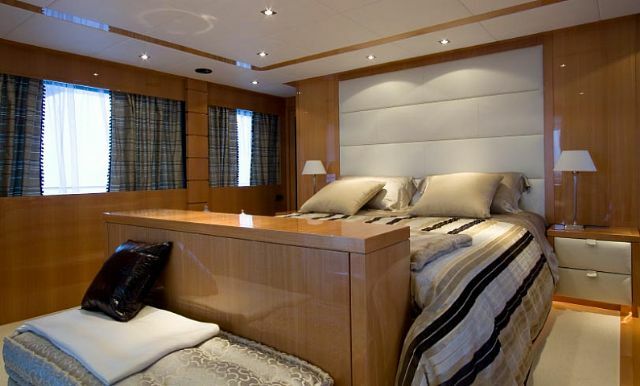 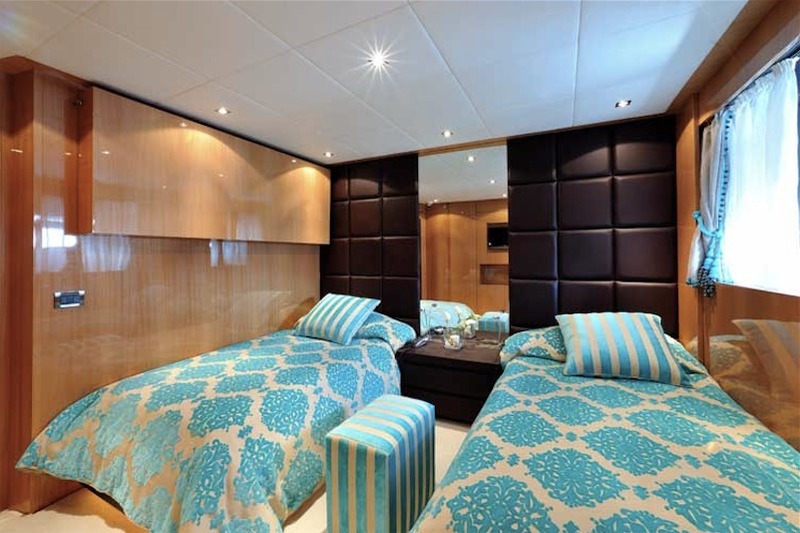 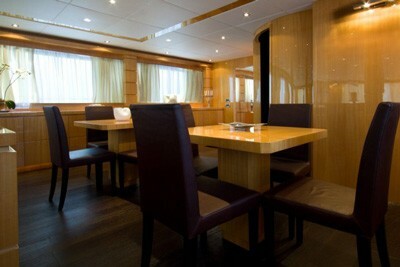 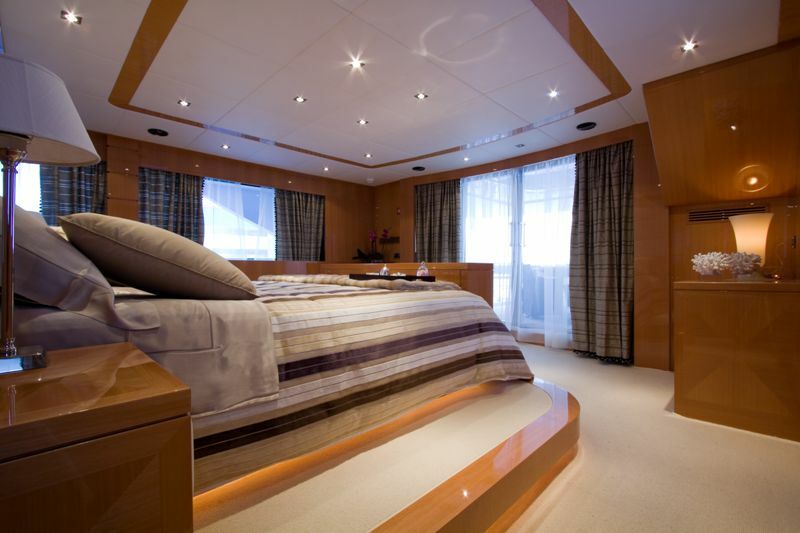 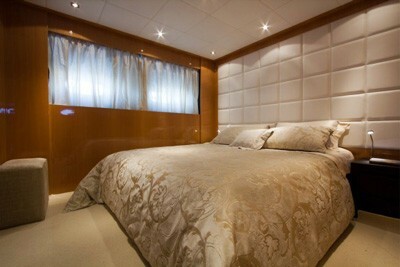 Below decks a further 4 cabins offer queen size beds, seating, vanities and en-suite facilities. 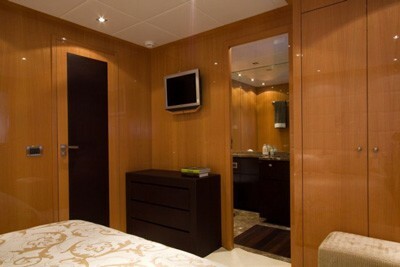 Two additional guest cabins have side by side twin beds. 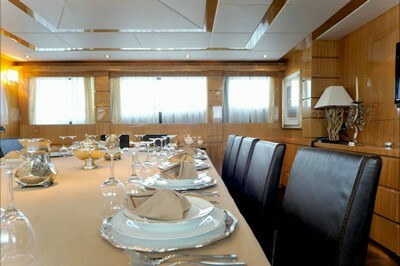 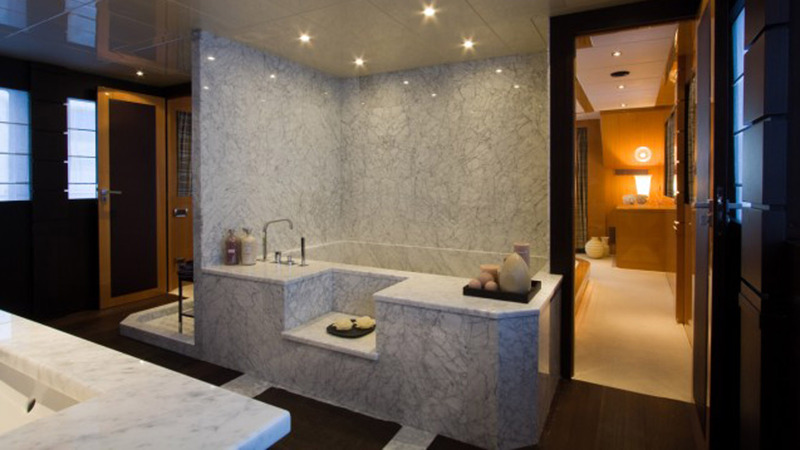 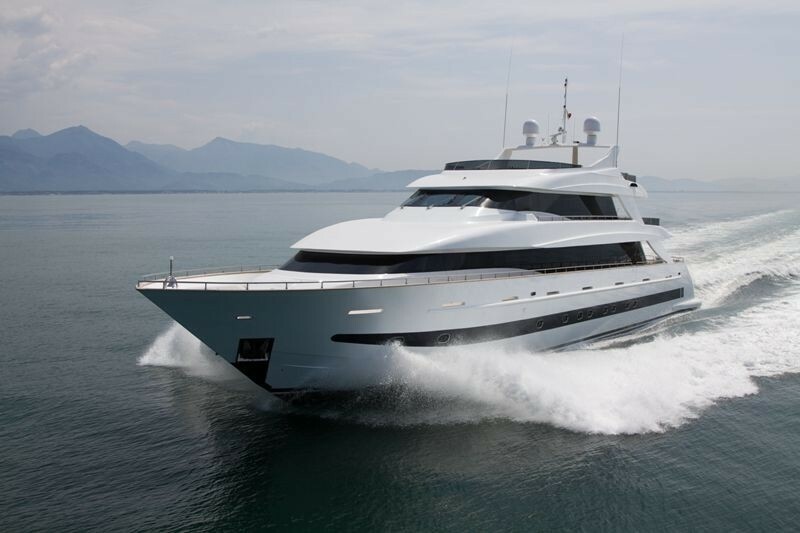 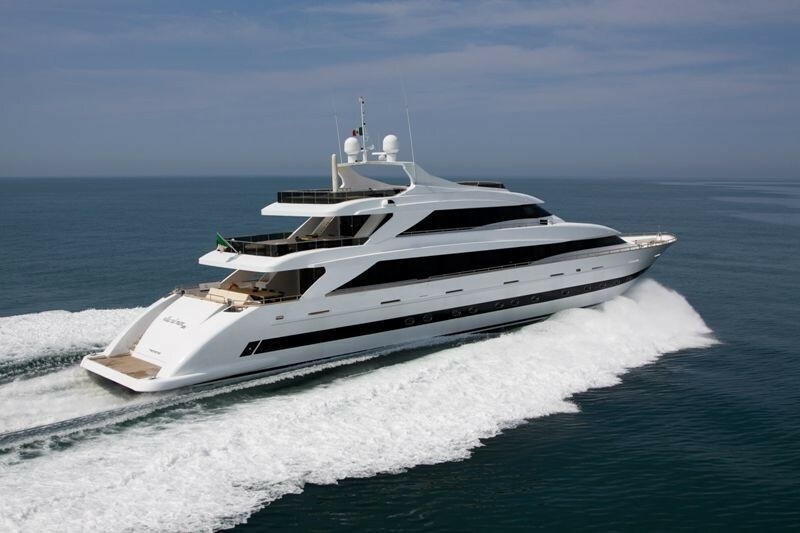 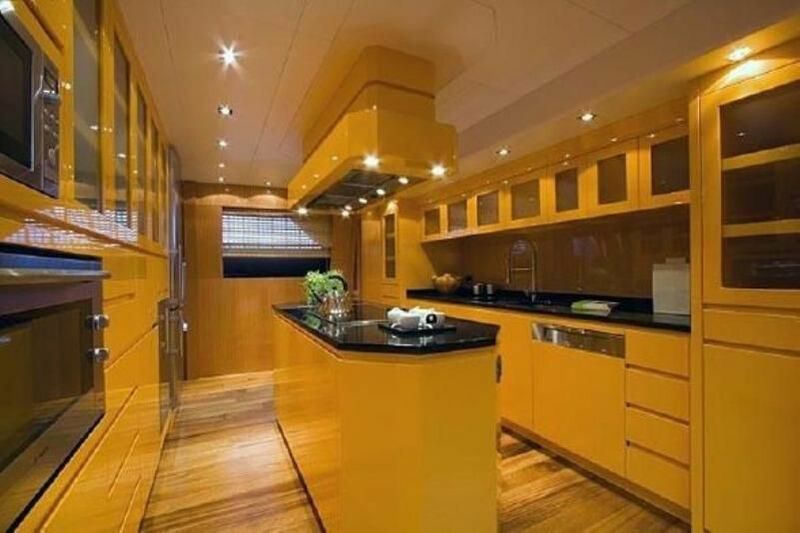 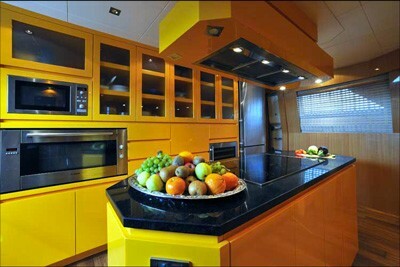 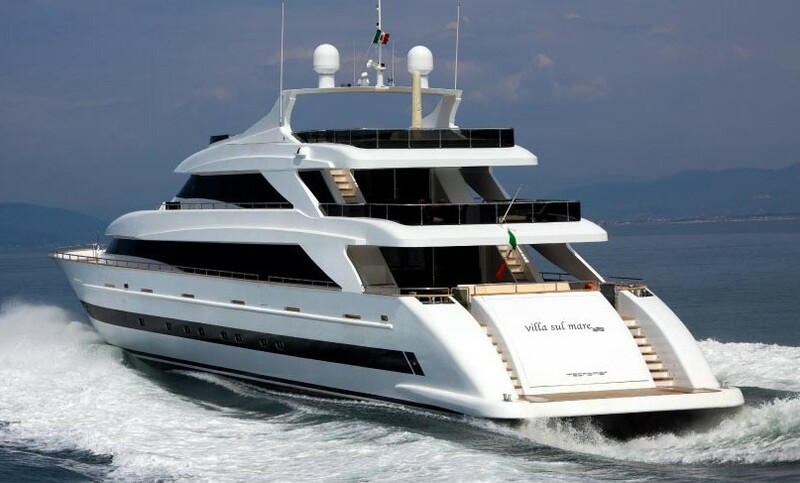 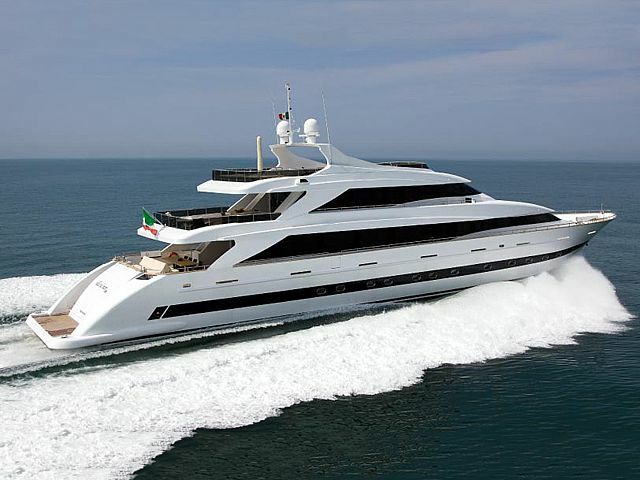 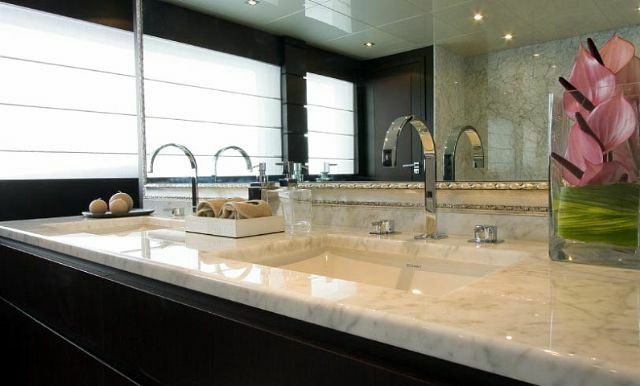 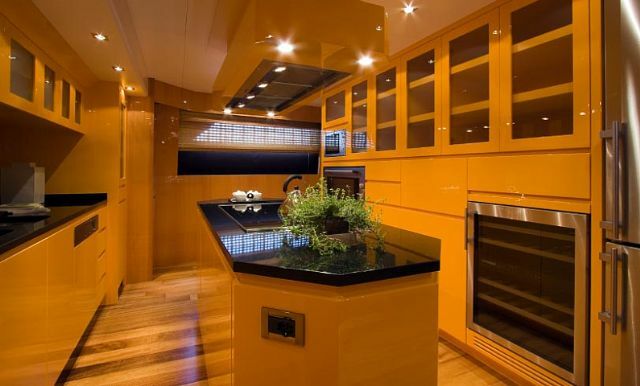 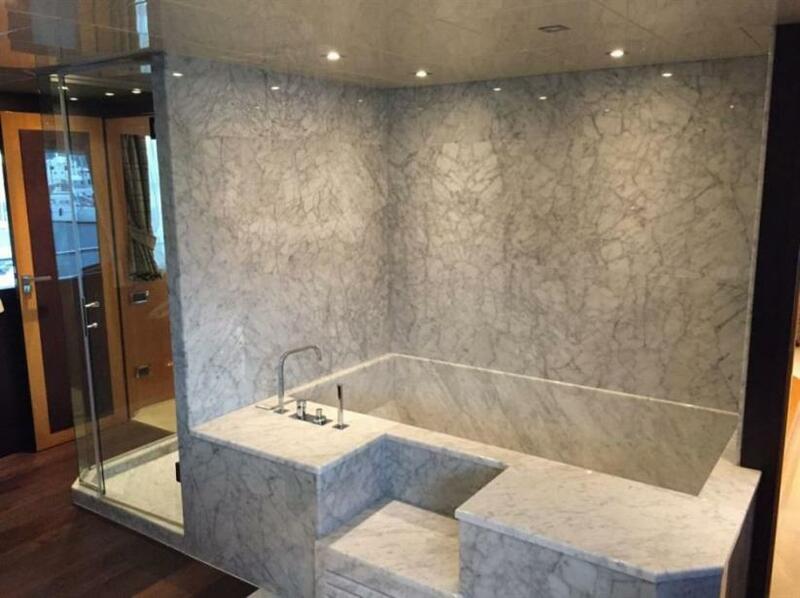 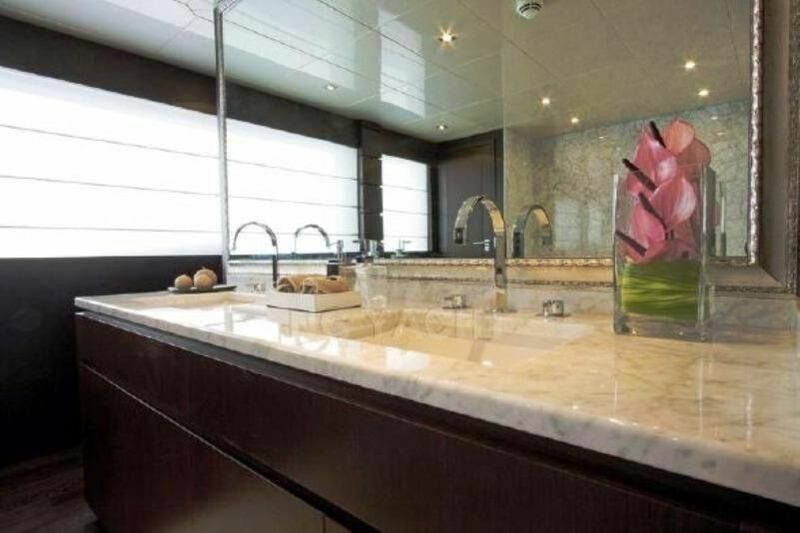 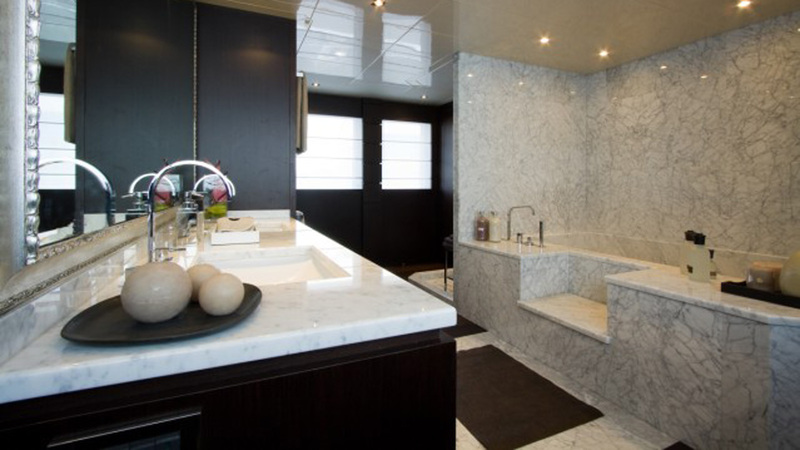 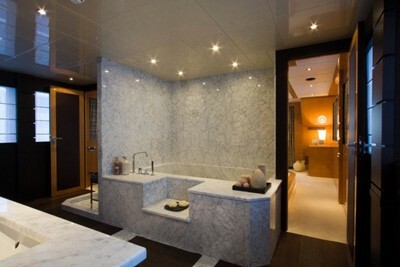 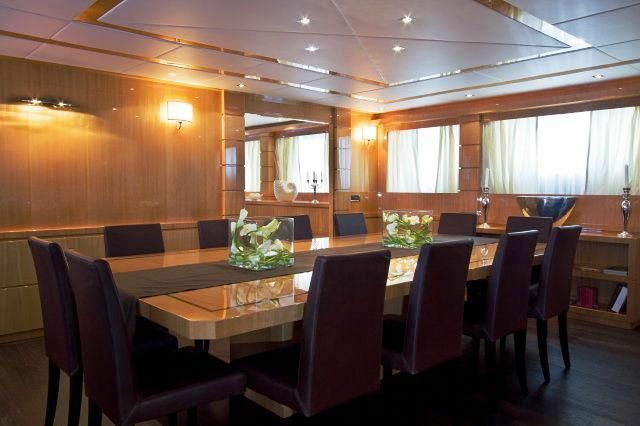 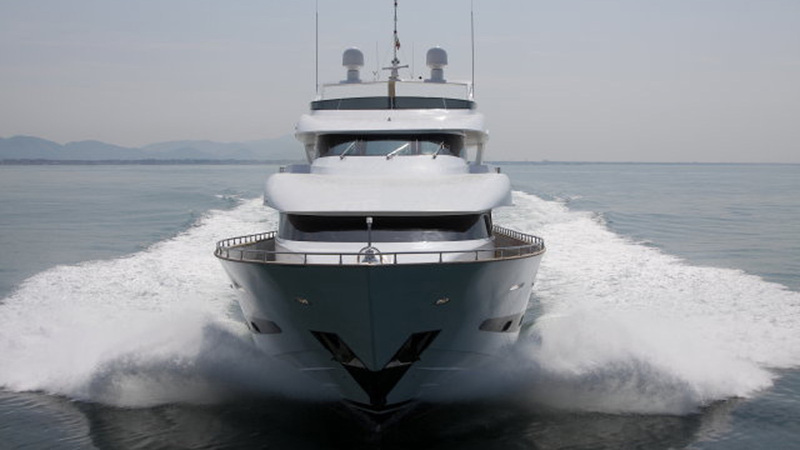 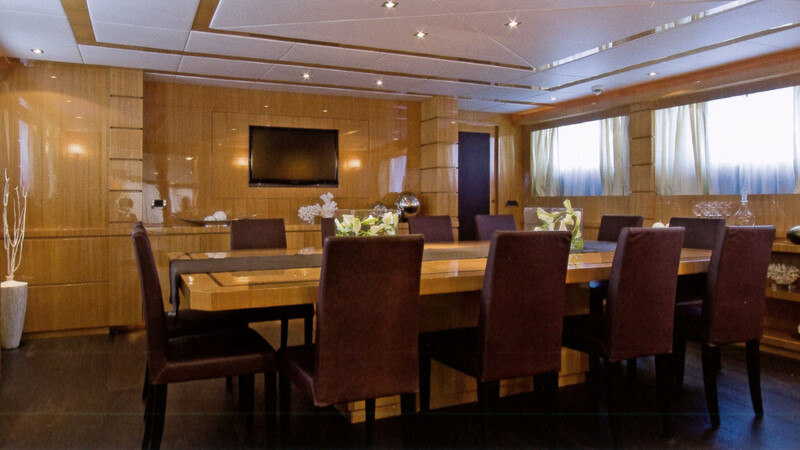 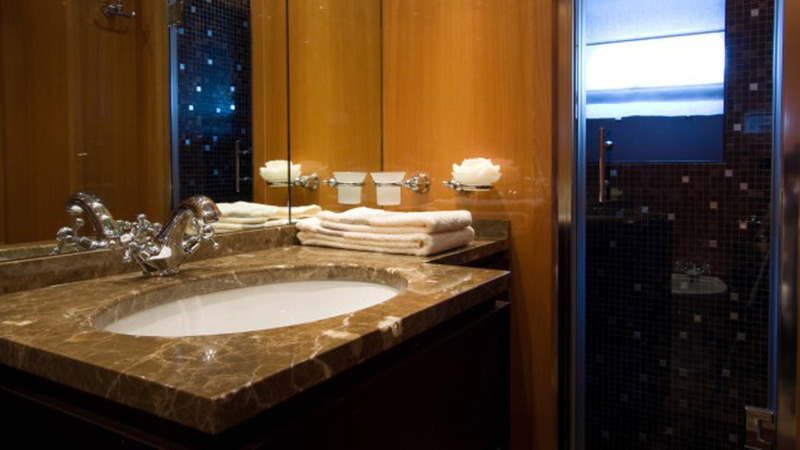 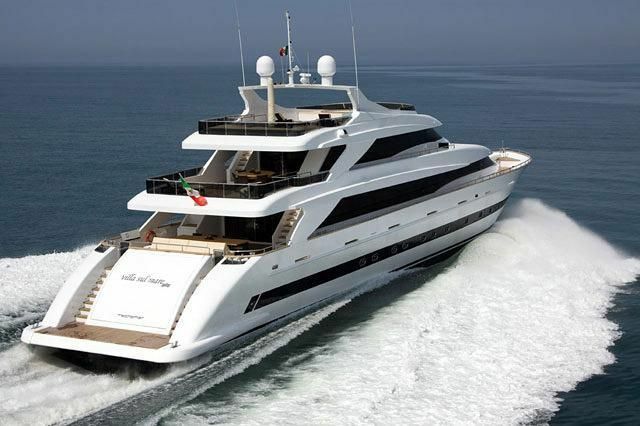 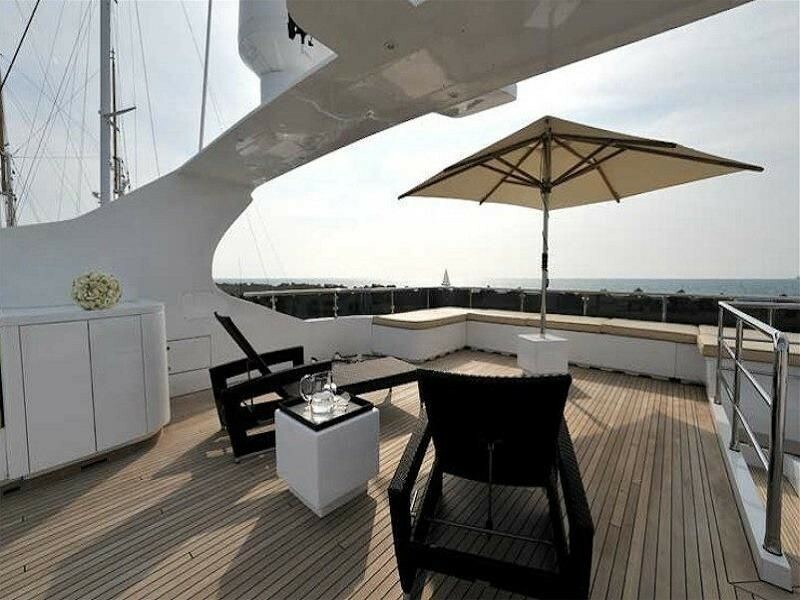 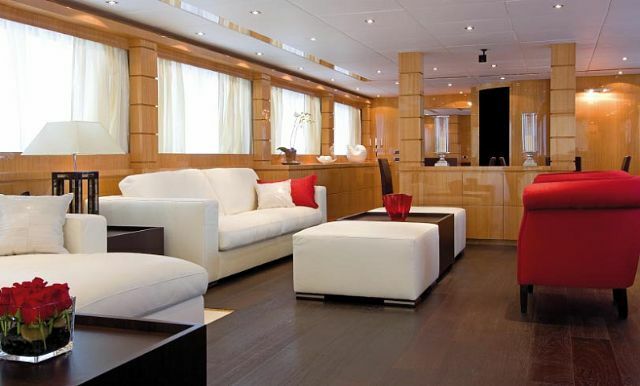 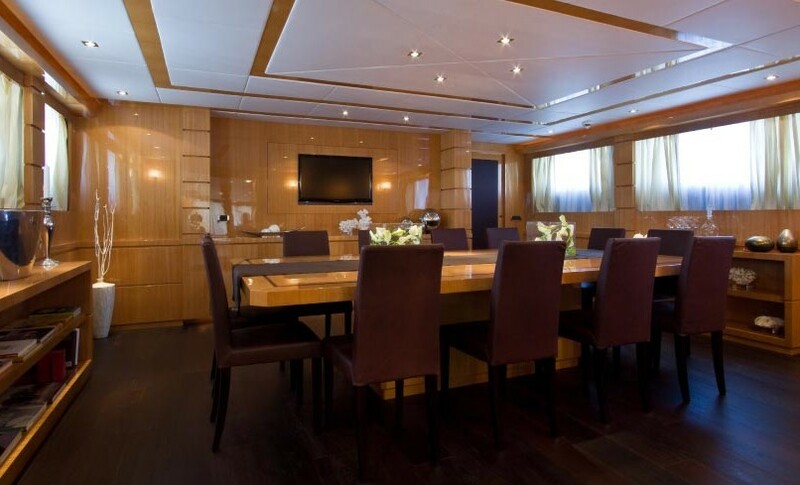 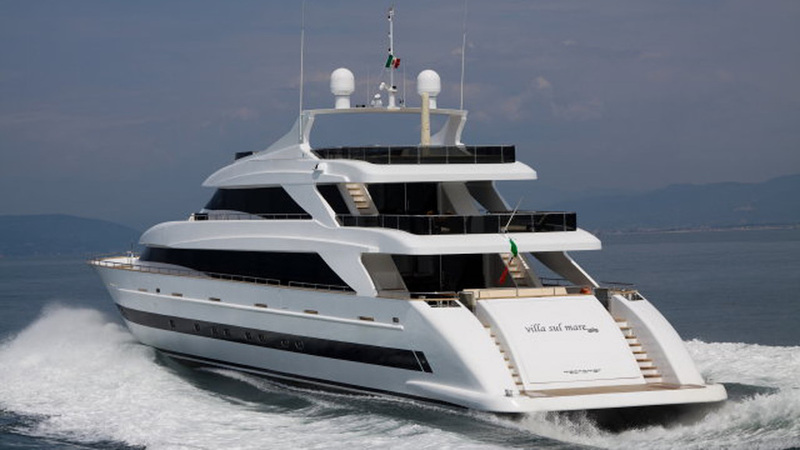 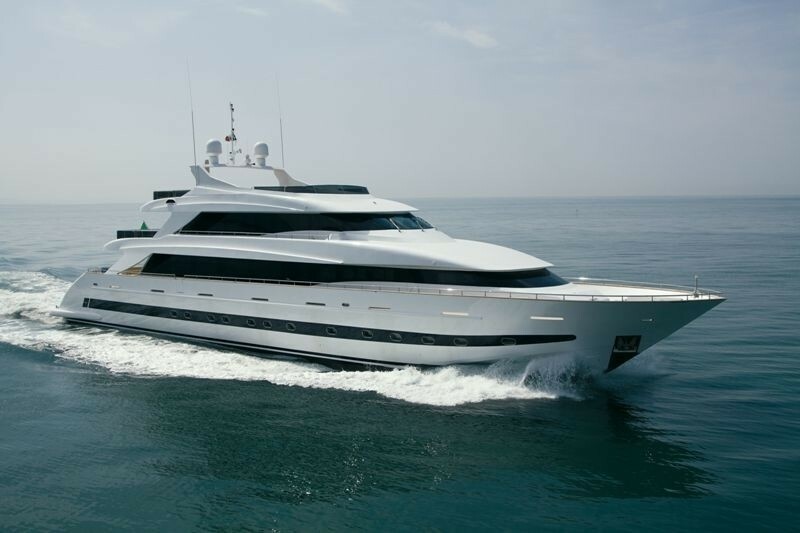 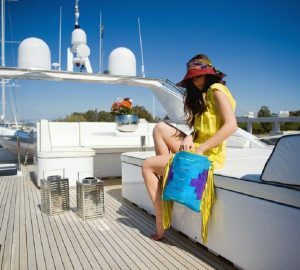 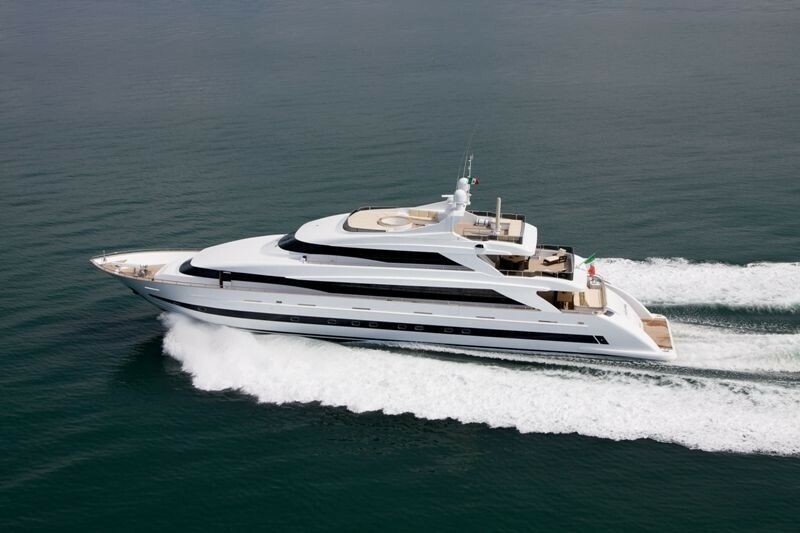 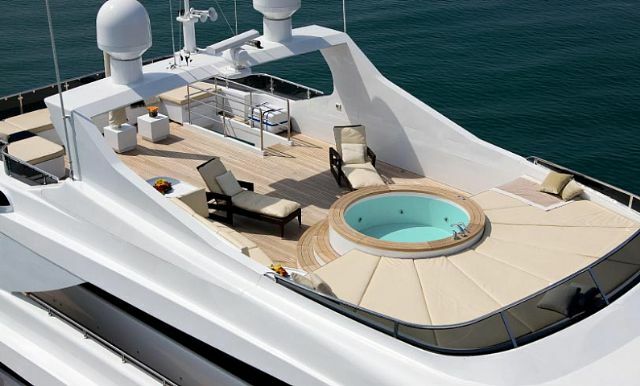 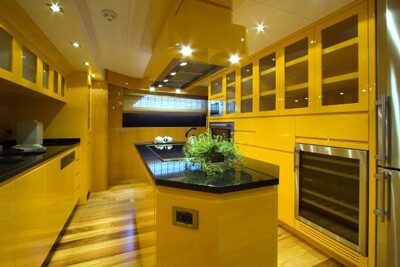 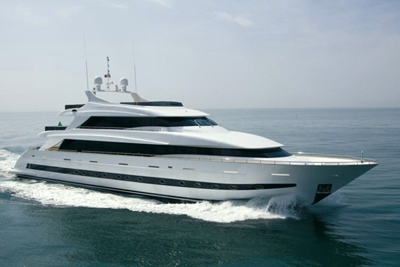 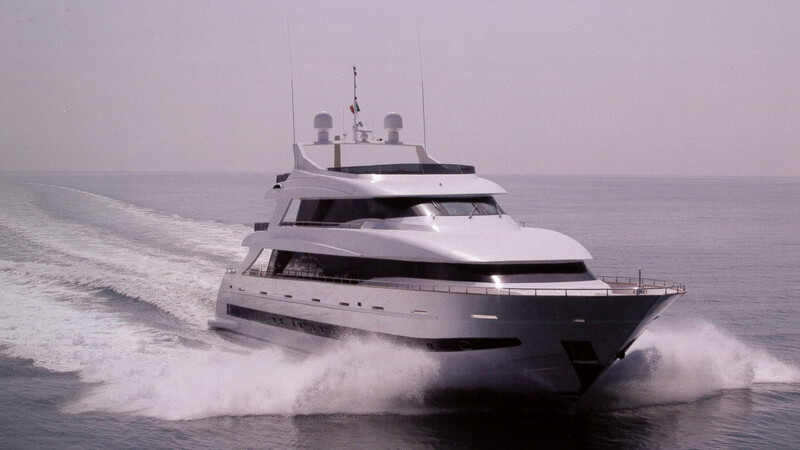 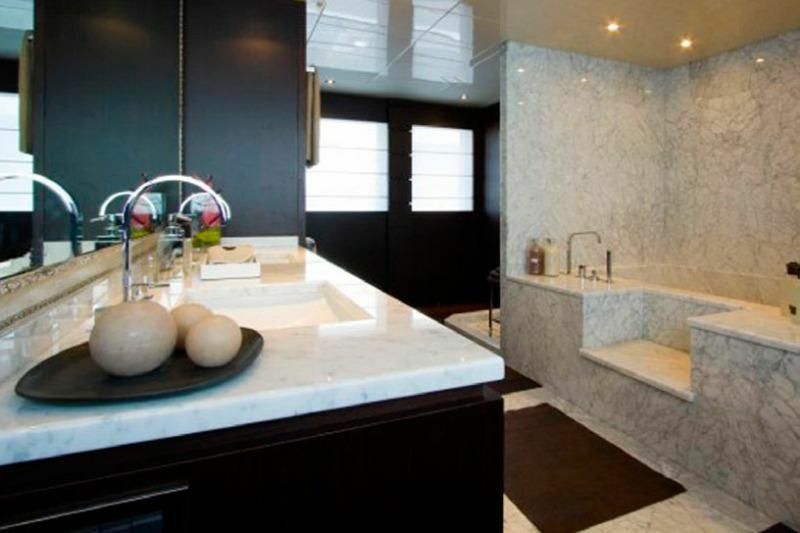 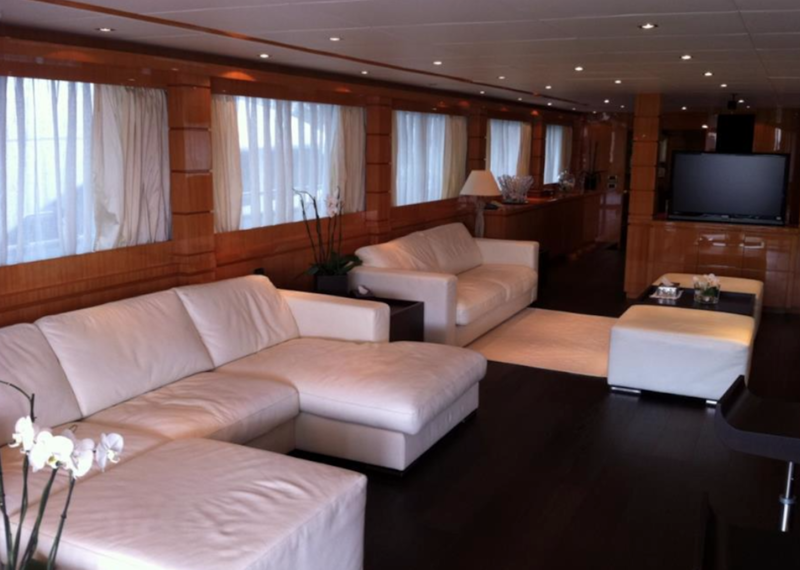 Super yacht VILLA SUL MARE boasts a neutral yet tasteful décor, she is the ideal yacht for large groups and families.